Description Mr. J. Nicholls (copy). This group of soldiers are from a mounted regiment. Possibly Australians, although the hat band is not like the Australian puggaree and there is no badge on the upturned brim as Australian soldiers wore. 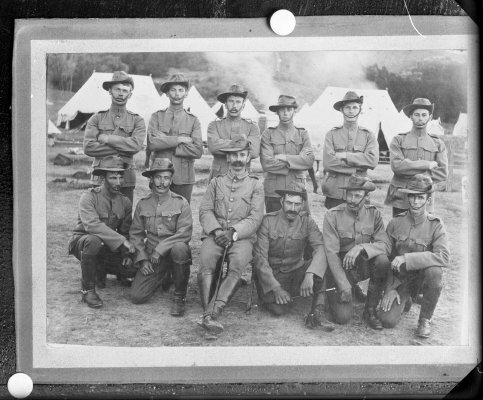 New Zealand soldiers did wear their slouch hat with the brim up on occasion and the hat band is more like a New Zealand one of 1910 with the chin strap looping up to hold the brim in place [source: http://www.nzmr.org/kit.htm].